“This is an election year and there are more than a million people who say this is important to them. This is petition has nothing to do with whether or genetically modified foods are dangerous. We don’t label dangerous foods, we take them off the shelves. This petition is about a the citizens’ right to know what they are eating and whether or not these foods represent a novel change.” said Andrew Kimbrell an attorney for the Center for Food Safety, one of the partner groups on the Just Label It campaign. —Since October of 2011, the campaign has received over 900,000 signatures, with 55 politicians joining in on the movement. So what’s the problem here? The problem — is IGNORANCE … see.. the FDA doesn’t give a flying f&^! about your opinion or 254 million of your opinions. If it is wrong, they’re going to slam it into the dirt, and they don’t care how many lawyers and fake doctors and BS studies you have that say its ok or Who’s party you are backing. FDA is not a FAN club people. FDA runs on FACTS. Not opinions. So the problem is NONE of you are qualified to give them your opinion… and thank god for that… the sadness here is that your vote counts as much as mine… Bet you people also send signatures to the Supreme Court… sheesh. Is it like an ‘Activist’ thing? or what? The FDA would love to do this for you. Do it in a heart beat. Call them. Ask them. — You know what this is? This is ‘distraction’. And you are welcome to it. Why in the world would the FDA — the people who love to label things… Not want to do this? Get on their email list! I get at LEAST 20 notices of new stuff they are dropping the hammer down on EVERY week. Why did the admin delete the comment after being so careful and a took a long time to add a good amount of work to add good Intel.,? Your entire point is senseless if you delete good Intel too like the article says the F.D.A. does for no good reason. I tried to give you a break and go back to the previous page but you even prevent people from retrieving their own work unlike most other webpage you have that option impossible to make people lose their work too. The FDA can no longer help you, Michael Taylor is in charge. Food is supposed to nourish the body and food made with chemicals or chemical byproducts will not nourish the body. Adding chemicals to your food should be considered criminal and therefore outlawed. Why can't we force the food companies to remove chemicals from food…seems like it is criminal to allow it since it's ill affect on our lives. I think it is en excellent idea to förbid chemicals or chemical byproducts in the food. Most people who go to the store to buy good looking cheap products. Price is a big issue. How to make laws to produce cheap food and make us and the nature healthy? It seems to me that the Obama Admin. if it is reelected, should do a major overhaul of the FDA. I've been hearing complaints for years about the FDA and have one or two complaints myself. It has become increasingly a political organization loyal to Big Pharma and Agribusiness and less and less interested in protecting the public from harmful additives and toxins. I began to cook for myself in the 1970's because it seemed wise to know what I was eating even back then. Today with the growing of GMO produce and increasing additives (I've been told that the FDA has allowed foor companies to add "edible polymers" to cake fillings and frostings) even cooking doesn't provide as much protection as it should. Are you serious about Obama making changes to the FDA? He’s a big investor in Monsanto and he and his family only eat organic non GMO. Then why would they invest in Monsatan? realistically, nothing will stop these scumbags. They have professionals for everything, if the people get angry, they will use other methods or even cause incidents so they can get their way. The only way the people get freedom is well.. probably causing war. Agree with Sean! Greed is the basis of all these issues. Of on another instead of uniting, that is why such an effort to get fid of unions now. Any laws written that are unconstitutional should have the sponsors impeached. Because there's always tomorrow. Everyone riot and overthrow or stfu. Maybe I should also start making gmo labels to paste on every box of General mills cereal when I go grocery shopping. How about if we all flood the FDA email box with what we think and what we want from them? I think I'm going to super wall mart with a big sign to stick in the corn bin that says "enjoy your GMO corn"
I don't understand how that little informational poster can say that "91% of Americans Want GMOs Labeled" but only about a million total people signed signatures saying they want labeling. 1 million Americans is not 91% of the population…I'd like to know where they got that 91% from. One in three hundred persons in this country, including children I presume is our 300 million population, is an extremely responsive voice. It is estimated in most petitions that one signature would indicate that at least one thousand others would agree. My statistics may be off but the majority of people are not on the internet signing petitions. They do not have the time and are not getting the emails that alert them to the petition so don't downgrade that number. It is something that the FDA is criminal in ignoring, in my opinion. The people who are making the decisions there must be removed from their jobs and people with conscience replace them. Problem is that most people working for government are working for themselves, and do not perform their responsibilities according to their mission. This is so tragic. The Department of the Interior, with Kenneth Salazar, is just as neglectful. It is permeating government at all levels. Not shopping at your local grocery store will only hurt them. You will not put the FDA or Monsato out of business. Every grocery store I've been in offers organic products. Just buy more of them and control your weaknesses for junk food. Just because something is organic, doesn't mean it's non-gmo. Actually certified organic foods CANNOT contain GMO's. However if it's just labeled as "all-natural" or something vague like that, then you're right it's no guarantee. The FDA has long since lost the trust of the American people and has gone into the realm of criminal behavior. It's time for Americans to decide if they are willing to put up with an organization that has exposed itself as a destructive tool against Americans with an agenda in line with the criminal eugenicist elite. hi, Im based in england,suggest you contact the various sympathetic organisations in the uk. with a view to adding their weight. the members of the or ganisations could direct comments direct to yhe fda.if nothing else it would send amessage. the progress of gmo depends on exports from various countries.The uk. government here is at least prone to approving gmo.and not labelling goods if they could get away with it. FDA and EPA have been bought by big money long ago. As a former FDA employee, I have to add another reason FDA supports unsafe food such as this, is that many employees leave the agency and go to work for the likes of Monsanto. They aren't going to jeopardize their financial future by making potential employers mad and properly enforcing food and drug safety. You know….I rhought about doing that, but, there are video cameras everywhere, and, if Monsanto can PROVE that you were disparaging their product, be prepared for the consequences. I planned to do that in the organic aisles to defferientiate (sp?) between 100% natural vs. organic, but I chickened out. Monsanto can be mean! I suspect that my web site email was hacked by them after I commented here on another issue, so BEWARE! They are out to get you! Just saying something has GMO in it is not disparaging…unless you know the truth. I'm sick of people saying I should grow my own food. I should buy at farmer's markets. I do that. And that is not the point. The point is, I shouldn't have to! I should be able to know what is in the products on the grocery store shelves, and that stuff shouldn't be full of toxic crap. We need to hit them where it hurts. Why continue to buy processed foods at the grocery store. Email the GMO shopping guide and stick to items on it.Start a community garden, join a health food coop, have friends go grocery shopping together at farmers markets or to farms that sell direct(if you are lucky to be near one). If everyone who signed the petition tells at least one to not purchase anything from the grocery store for 2 or more months it may affect their bottom line or at least reduce their profit margins, something their investors watch. We have the power to change the world based on our actions or non-actions! Get growing…. I'm lucky to have 3 grocers near me to purchase organic fresh fruits & veggies plus other health food needs. Agree with you 100% thanks! Exactly right! The FDA has long exposed itself as an enemy of health and it is CRIMINAL! u r rite,but it is wat it is & that's how it is sad is'nt it? not only sad but it's also criminal. I think one commentor above hit the proverbial "nail on the head" by saying to shop at local farmers markets but also regardless of whether the label products GMO or Non GMO, I think the important thing here is that everyone here has a right to Not Buy Any Product That You Feel Is Not Safe, in other words, BOYCOTT!! Also everyone here can start your own greenhouse and grow your own vegetables. I'm going to assume that a Greenhouse would stop possible GMO cross pollination dead in its tracks but that's just my opinion. Have the right to "not" buy a product? Hello if obama care passes we do not- we will be mandated to buy a very expensive product at that!!!!!!!!!!!! !the tyrants are comming for our money and our health its going to come to staying healthy, out of jail, and not bankrupted from the tyrants that want us just that!!!!!!!!! When it comes to the labeling of organic, natural products, including many herbs and supplements, the FDA's demands on small farmers and businesses are stringent, unreasonable, even punitive; but when the people rise up and ask for a little truth in labeling concerning products promoted by giant corporations like Monsanto and ConAgra, the FDA issues a pass. Raw milk suppliers get their homes and dairies invaded in SWAT-style raids while their livelihoods are held hostage by government agencies under the guise of protecting the ignorant public from the dangers of one of nature's most life-affirming substances. Monsanto, whose GMO products have been linked to kidney failure, hormonal disruptions in the endocrine system, compromised immune system functions, et al., is held harmless from scrutiny or oversight. I used to feel that it was unfair for the FDA to have such harsh restrictions on Organic, but, now, in a way, I am glad. I know that anything labeled USDAOrganic is INDEED organic. Most people don't realize that 100% natural DOES NOT mean organic…just a little trick that the food companies use to get you to buy their GMO products! The revolving door in Washington from Monsanto to the floor of the senate and congress, is ABSOLUTELY the reason that the FDA tossed the signatures. On "Food, Inc." you learn that Monsanto has passed laws that make it illegal to complain about their products, as it "disparages" their product. Meanwhile, the village idiot can go buy RoundUp and spray it all over their yards and poison their own kids and critters in an effort to control a few weeds and Monsanto takes absolutely NO responsibility! Their fertilizers wash into our water supply at alarming rates, and Monsanto rakes in the money! Monsanto sues farmers who have had the misfortune of being Polluted with the pollen from the neighboring GMO crops and THAT IS THE FARMER'S FAULT! THEN THEY SUE THE FARMER, PUT HIM OUT OF BUSINESS AND CAN BUY HIS NEIGHBORING FARM LAND AT PENNIES ON THE DOLLAR…and Monsanto gets bigger! In some states you cannot even collect rain water because it is against the law to divert water from going downstream….TO MONSANTO! Monsanto will not be happy until they own every morsel of "food" that we buy! Maybe that is another "law" or "regulation" that should be modified to reflect the global interactive technology world that we live in! Who writes to their politicians? Very few of us. We cal, e-mail and sign petitions on line. What is all this 18th century communication doing to us? No good! It's just a way for them to avoid us. They know no one writes letters like that anymore. That's why it's the only thing they ' accept'. The signature itself should still count LEGALLY. It's nothing more than an excuse. Why are we even allowing this to go on anymore? It's insanity to me. Our 'vote' on the matter should count. This is a democracy no?…guess not. Furthermore, even if GM food is safe for consumption, there are a lot of other environmental reasons not to want to eat GM food. We are denied our right to choose. Even if they were sent 1 million physical letters, they would invent justification to dodge them. They are more crony capitalists that only Ron Paul has shown the nerve to face. Illegal actions: FDA has acted illegally by its failure to fulfill its obligations vis-a-vis the law of the land – US constitution i.e. to protect welfare of the people – as opposed to welfare of corporations and special interest groups. Also illegal is FDA's actions conducted in conflict of interest status – i.e. former private corporation functionaries now occupying public positions. Very likely – bribery, kick-backs, other non-monetary perks have been made. Therefore, FDA is now an illegal entity, no longer part of the US government – per us constitution – and carries no weight in any matters pertaining to the USofA. It is also illegally posing as a US government agency. The FDA – all working for it – starting at the top – down to the lowest levels – have forfeited their status as a government agency and must be removed, so that a constitutional mandates (securing welfare of the people) can be re-established (best to abolish this corrupt institution and start over). Call the local sheriffs and demand arrests of all persons operating for, on behalf of this illegal entity. can't legal action be started against the FDA? The FDA is full of former Monsanto heads. That's why Obama appointed them. Monsanto is a huge campaign contributor. This is the definition of a Fascist state according to Mussolini. It has been known for 10 years that government views a petition as a single letter. That's activists have letter writing campaigns, not petition signing campaigns. Take envelopes, stamps, paper and pens and get people to write letters, not sign petitions. The problem is actually with the leadership of the petition campaign, being ignorant of something they should have known. No matter what the excuse, anyone looking at thousands of signatures on a document and calling them "1" is ignoring the will of the people and not particularly bright either–though clever in a wily way. Not the same thing as true intelligence. Please point to this definition of fascism to which you refer. I agree that it's a horrible practice and I don't trust the FDA because they have made it abundantly clear that they are more concerned about corporations than actual food and drug safety. However, I wish people would stop throwing terms like "fascist" around. It does not further your argument. 1. The USDA created GMO diseasses on Plum Island, NY. That explains their 'standards'. More can be known by looking into the Manhattan, KS & Ft. Detrict, MD GMO weaponized disease "projects". 2. Everything the government does is for APPEARANCES ONLY. The key is: "follow the money". It all amounts to "smoke & mirrors" to keep people from discovering the truth about their evil schemes. 3. "Composite government" owns nearly all assets in this nation. They rig the "market" to profit from their Wall Street and international derivatives 'gambling' schemes. Why would the OWNER of such a profitable scheme make rules to cut their own profits? Remember, the "reserve requirement" of the federal reserve banks are "backed" by the GDP. Who do you think "pays" the people behind the GDP? Who do you think "owns" the corporations that pay those people? COMPOSITE GOVERNMENT. Go read their 60,000+ CAFR/AFR reports. 4. Bill Gates has a Foundation that funds the acquisition and storage of all known NON-GMO seeds. It's in the Netherlands, buried deep w/i a mountainside. Ya think he knows something about "plans for the future" that we don't? 5. The FDA tried to shut down Dr. Brezinski (among others), who "invented" a "cure" for cancer (about 25% effective). Who do you think "owns" the medical industry or "big pharm"? 6. Let's call it what it is: EVIL GOVERNMENT BUREAUCRATS who run a protection racket, and trample the rights they SWORE to "secure" under the fundamental law: "Declaration of Independence". Do some real research on the subject of GMO's. Fresh produce that is a GMO itself? Sherrill and Maggie , what happens when the GMO's cross pollinate and contaminate the organics ? It will happen and is already in the process . They don't believe that there is any natural canola left in Canada . Another thought , what happens when the US government decides to release the terminator gene . This gene renders any seed sterile , meaning that you will have to buy seed every year and as is already happening , only the seed they want you to have is made available . And I agree eating healthier foods lead to a healthier life style , but you have to have the healthier food . GMO's must come out of the system before everything becomes gmo . In response to:"Have none of you ever eaten a Kiwi or a potatoe??? these were GM foods in their time … you have to be very careful about your own choices … I believe labeling would be good but if you eat more fresh produce and less processed the question wouldn’t arise …"
That's not true. Although eating fresh food does help for sure. Beside that, it's not just about what we ingest. There are very serious environmental implications here. And "Hybred" is not that same as GMO. As suggested by another commenter, do the research. It's the only way away from eating GMO. And a shopper really needs to know their stuff. The info war is a bloody mess! Full of lies. One actually have to know what one is talking about when it comes to health AND ENVIRONMENT. Neither one is a small topic. The average person doesn't have the time, desire or patience for it. It's wrong to do what they are doing and even more wrong not to label it. They Know their sales will drop dramatically. Otherwise, what's the problem??? The FDA comment link appears to be disabled … it's not submitting my comment. Make Ron Paul President and you will eventually be able to say goodbye to the FDA because he will get rid of them. Ron Paul will not get rid of the FDA. We do need the FDA but, as he said, they have too much over reaching power and have no oversight for FDA. However, it will be reduced but, not removed completely. That's what I understand him to say or, I misinterpreted his stance on the FDA. The problem with the FDA is not that it is too powerful but that it isn't fulfilling its mandate. It is supposed to safeguard our food and pharmaceuticals, not run interference for corporations so that they can increase their profits, and let the buyer beware. In other words, it is a libertarian mole within the government already, resisting regulation because the free market ought to be sufficient (tell that to the people who have died of E. coli, the incidence of which has skyrocketed since we started letting beef producers write their own rules). Exactly how would a libertarian president improve the situation? When you say, "you have the right to know what is in your food" – what do you mean? what will be in our food? poisons? u think we shouldnt have that right?? China is making rice from plastic and potatoes! Need I say more? If its genetically modified food. Its not 100% made from nature. Its been altered. Its been proven in animals to cause cancer, sterilization and other problems perhaps not the 1st generation but, definitely the 3rd generation. It might not effect YOU now but, it will effect your children and their children. I'm shocked the FDA allows this when when we're not allowed to have raw milk by our God given right to have choices. We are not FREE!! What we can do while we are working on labeling and getting GMO out of food supply is to buy as much local produce as we can….shop farmers markets and stop buying processed food! It's funny that Monsanto is against labling when their own CEO once spoke in favor of it. I sent an email to Pirate Brands asking if they use GMOs in their products; I received a prompt reply that said, in part: "At this time, we seek out and purchase ingredients from non-GMO sources. "However, due to possible cross-contamination during processing and transportation and naturally occurring cross-pollination we cannot ensure that our products are 100% GMO-free; thus, we feel that it is misleading to our consumers to advertise as non-GMO. "As you may know, there is very little consistency in non-GMO labeling claims. Manufacturers can currently make claims according to their own internal criteria, which can unfortunately include empty and unsubstantiated claims. Non-GMO labeling requirements remain grey and unchecked by any federal or state regulatory entity." So, would it really make that big of a difference to require labeling, or would it merely be another meaningless labeling requirement for food manufacturers? Who would be responsible for oversight? I don't want to eat Franken-foods, but I don't want to give the government any more power than they already have, either. Pirate Brands' statement is, at best, only partially true. There is currently no legal requirement as to the criteria for non-GMO labeling, and some companies are undoubtedly making non-GMO claims that can't be substantiated. But as of the past two years or so, the Non-GMO Project — an independent, third-party organization with stringent testing standards — has been verifying products to be GMO-free. As I understand it, the testing standards are significantly stronger than those for USDA Organic certification (which is already a pretty good standard) in regard to GMOs. USDA Organic labeling is not perfect, and has been corrupted somewhat from its original standards, but on the whole is a successful and highly meaningful label. 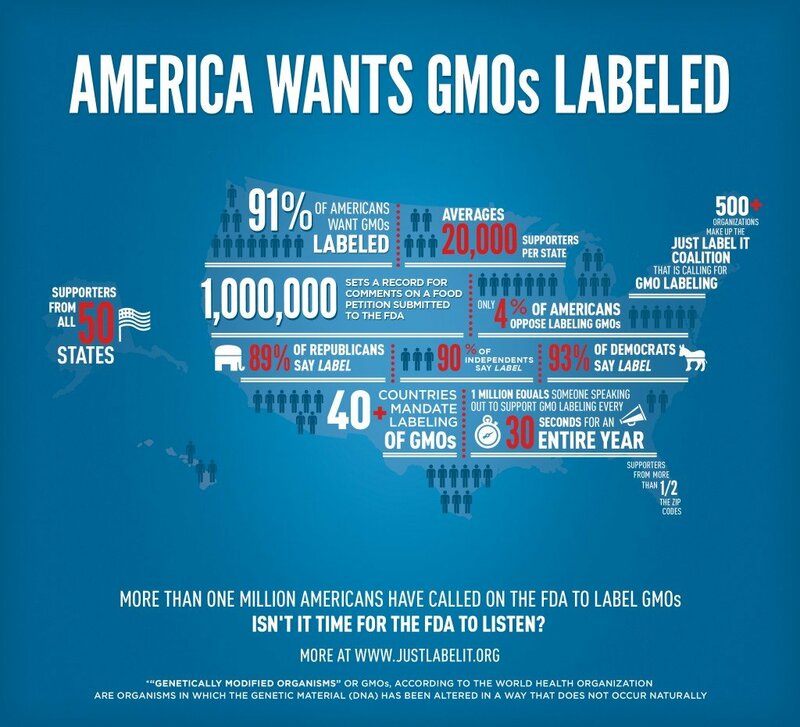 There's no reason a GMO labeling requirement couldn't be similarly implemented. The point of fact is, labeling isn't that hard, and it could be highly meaningful. The reason it isn't happening is because the business of GMOs makes a few well-placed people a whole lot of money. I think it would be meaningless. What we should be demanding is to stop GMO all together because it contaminates all foods and no one wants it except the creators that are making all the profits. A few greedy, and sick people that don't mind destroying the food supply world wide for their own gain. agreed!!! I think a battle that was thought to be possible to actually win was chosen. Then root them out b/c their sales will drop so dramatically? Mitch, can you sent that link to Activist Post via facebook or their website? Go to this link to comment directly to the FDA .. Le's give them a million online comments….. I hit "submit" three or four times on my comment on the link page above, and I couldn't tell if it went through.